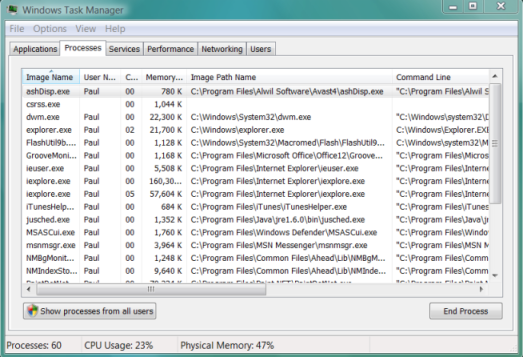 Windows task manager has finally received a much needed make over. Something that’s always irked me was that I’d see these processes but not necessarily know where they are running from. In Vista you can customize the processes tab. The easiest way to open task manager is to right-click anywhere on your task bar (or the clock) and select Task Manager from the popup. When task manager pops up, select the Processes tab. You’ll see a list of running applications, the user they are running under etc. With Vista you can add some additional useful info. At the top of the window select View -> Select Colums. When presented with the list select Image Path Name and Command Line and you’ll now see where your processes are executing. The screenshot below shows an example of what it will look like after you’ve made the change (click the thumbnail for a full screen image).